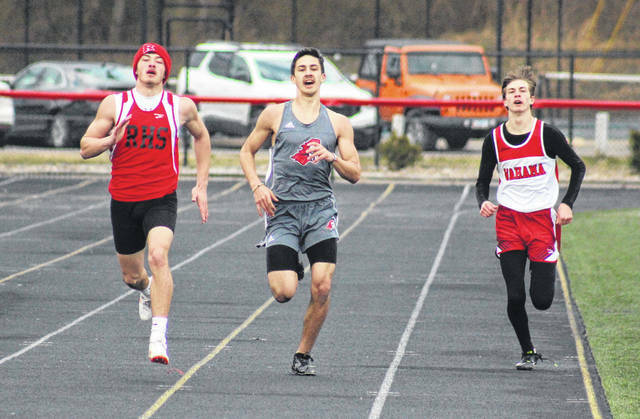 Wahama’s Josh Frye (right), Point Pleasant’s Nick Leport (center) and Ravenswood’s Austin Garrett (left) race down the final straightaway, during 400m dash on Friday in Point Pleasant, W.Va.
Hannan freshman Madison Gill runs in the 400m dash, during the Paul Wood Memorial Invitational on Friday in Point Pleasant, W.Va.
POINT PLEASANT, W.Va. — Top competition from the start. 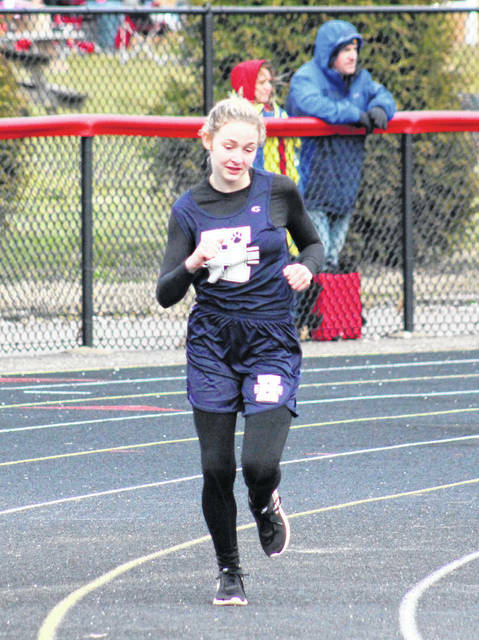 The Point Pleasant, Hannan and Ohio Valley Christian track and field teams began their respective 2019 seasons on Friday at the Paul Wood Memorial Invitational hosted by Point Pleasant, with Wahama competing in its second event of the year. The boys team title was won by Cabell Midland with a score of 151, a full 54 ahead of Winfield in second place. The hosts were third with a 66.5, followed by Hurricane at 59.5, Huntington at 42, Ravenswood at 38, Riverside at 23, Ripley at 20 and Buffalo at 19. Wayne and Poca tied for 10th at 16, while Capital rounded out the 12 scoring teams with a 10 points. Hannan, Ohio Valley Christian and Wahama were among boys teams without a top-6 finisher. The Black Knights had one championship relay squad, as well as one individual championship. The PPHS 4x200m relay team of Brady Adkins, Jovone Johnson, Preston Taylor and Garrett Hatten turned in a winning time of 1:36.74. Luke Wilson was responsible for the other gold medal, as he set a mark of 10:05.42 in the 3200m run. Wilson also scored in two other runs, placing fifth in the 1600m with a time of 4:43, and sixth in the 800m with a time of 2:13.97. The PPHS boys were runner-up in two relays, with the 4x100m team of Johnson, Taylor, Adkins and Zane Wamsley posting a time of 47.2, and the 4x110m shuttle hurdle team of Adkins, Kayden Eta, Nick Leport and Logan Southall recording a time of 1:06.22. Point Pleasant’s 4x400m relay squad of Hatten, Johnson, Leport and Alberto Castillo was fourth with a time of 3:58.29. A pair of Black Knights earned third in hurdle events, with Adkins running the 300m hurdles in 44.43, and Eta running the 110m hurdles in 17.1. Southall was fifth in the 110m hurdles with a time of 18.02, while placing sixth in the long jump at 16-10.5. Also finishing fifth for the hosts, Taylor ran the 100m dash in 12.14, Steven Trent cleared 10-00 on the pole vault, Caleb Higginbotham posted a distance of 38-2 in the shot put, and Brayden Connolly threw the discus 114-3. Gabe Hall tied for sixth in the shot put at 37-7. The White Falcons’ top-finisher was Jacob Lloyd at 7th in the 800m run. The top-finishers for HHS and OVCS both came in the long jump, with Jordan Fitzwater finishing 17th for the Wildcats and Andrew Dubs placing 22nd for the Defenders. Winfield claimed the girls team title with a 156, a full 58 ahead of Ripley in second. Hurricane came in third with a 95.5, Cabell Midland was fourth at 65, while Point Pleasant earned fifth at 54. Buffalo was sixth with a 45.5, followed by Scott at 16, Wayne at 11 and Capital with seven. Riverside was 10th with three, while Wahama and Poca tied for 11th with two apiece. The Lady Defenders and Lady Wildcats were held scoreless in the invitational. The Lady Knights won a trio of field events, with Addy Cottrill tossing 123-10 in the discus and 37-6 in the shot put, and Samantha Saunders clearing 5-2 in the high jump. Saunders also earned a third place mark of 8-00 in the pole vault and a fifth place distance of 13-00 in the long jump. Kayla Butler was third in the shot put with a distance of 32-3 for PPHS, while Hannah Gleason claimed fifth in the discus throw at 88-1. The Lady Knights’ top-finishing relay was the 4x400m team of Allison Henderson, Elicia Wood, Kady Hughes and Mai Pedersen with a third place time of 4:51.5. The quartet of Wood, Ashley Staats, Sydnee Moore and Teagan Hay was fifth in the 4x200m with a time of 1:59.12, while the team of Staats, Hay, Moore and Pedersen was sixth in the 4x100m with a time of 56.84. The Lady Falcons’ two points came in the 4x100m relay, as the team of Olivia Brooks, Lacey Neal, MacKenzie Barr and Abbie Lieving was eighth with a time of 57.94. A pair of 10th place finishes led the Lady Defenders and Lady Wildcats, with Chasity Deckard in the 100m hurdles for OVCS and Madison Gill in the long jump for HHS. Visit www.runwv.com for complete results of the 2019 Paul Wood Memorial Invitational.